After stirring up a duck craze in Hong Kong in May and June, the 18-meter inflatable duck created by Dutch artist Florentijn Hofman arrived at Kaohsiung City in southern Taiwan last Thursday. Some 500,000 people showed up to see the duck within five days, including on Saturday, when officials suspended the exhibition due to the expected arrival of Usagi. Kaohsiung City's love affair with the bird was kindled in 2009 when government officials went to see it on show in Osaka. "When we found out the rubber duck was coming to Hong Kong this year, we sent Hofman photos of Kaohsiung City and our mayor sent him a letter," said Zeno Lai, director general of the Kaohsiung Government Information Bureau and also the event's spokesperson. "By the time we met Hofman in Hong Kong in June, he said more than 300 cities had contacted him for the next exhibition, including more than 20 cities in Taiwan," said Lai. And it was all yellow ... in May and June in Hong Kong, where the big duck drew more than eight million spectators. According to Lai, Hofman was persuaded to bring his rubber duck to Kaohsiung by the city's tremendous enthusiasm for the unusual display. Hofman has been gratified by the royal treatment he and his duck have received in Kaohsiung, said Lai. "We understand there were minor technical issues with the duck when it was in Hong Kong and Beijing, so we tested everything at least three times," said Lai. "We have already drafted emergency plans in case of bad weather or of harm being inflicted by visitors." The duck, which had to be assembled in Taiwan rather than floated all the way there or flown, is inflated by a new air pump made by the Kaohsiung event team. "The rubber duck usually takes more than an hour to be inflated," said Lai. "But in Kaohsiung, it only takes seven minutes." 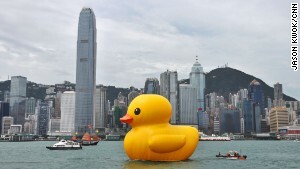 The team has promised to pass on its new techniques and any lessons learned to other Taiwanese cities set to receive the duck. The yellow bird will be docked at Kaohsiung City until October 20, before floating to Taoyuan and Keelung in northern Taiwan (that's apparently not too far for a big duck to float) later this year. The spectacle is expected to lure more than 3 million visitors to the harbor and generate tens of millions of dollars in revenue for the city. Kaohsiung City has a population of about 2.3 million people, so many spectators from outside the city will be making the trek just for the duck. After the duck's first week in the city, final attendance figures are likely to exceed initial estimates. Find more on Hofman and his famed fowl at the duck's official website.